Stunning vistas. Escarpments dropping down into a valley below. Gelada monkeys grazing peacefully at altitudes of 3,600 m (about 11,800 ft.). Ethiopia’s Simien Mountains National Park offers a taste of Africa that’s a bit different from the stereotypical East African savanna experience. Even its wildlife is not what you might expect. Rather than the elephant and the lion, here, you’ll encounter the Walia ibex, an endangered goat found only in the Simien Mountains; the Ethiopian wolf, the world’s most endangered carnivore; and nearly 20 other endangered species. More than 50 bird species are said to live in the Simiens, including the near-threatened lammergeyer, also known as the bearded vulture. 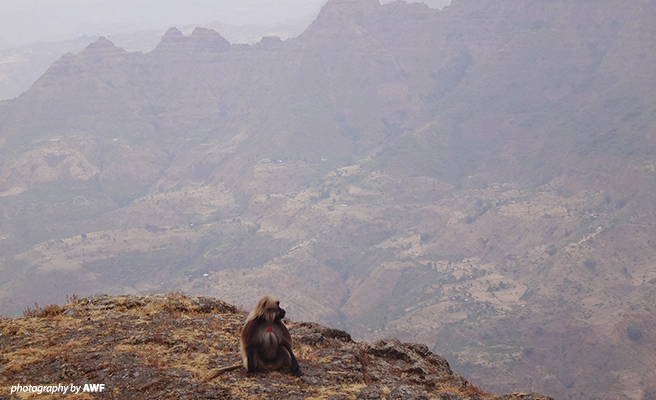 The biodiversity here is of such significance that Simien Mountains National Park was named a World Heritage site by the UN Educational, Scientific and Cultural Organization (UNESCO) in 1978. Unfortunately, this national park shares one unfortunate characteristic with many of Africa’s protected areas: It’s under threat. According to the UNESCO World Heritage listing, 80 percent of the park was “under human use of one form or another” when it was named a World Heritage Site. In 1996, it was moved to the list of World Heritage Sites in Danger. Today, human encroachment continues, with livestock grazing a particular concern in this stunning landscape. To conserve such a unique and vital ecosystem, AWF turned to its signature strategy: the cluster approach. This method is as it sounds: Rather than implementing a single conservation project, we instead group a variety of interventions in the same landscape. We target not only specific wildlife protection efforts or ecosystem restoration but—knowing that people are a key conservation threat as well as a key player in resolving those threats—make sure to incorporate solutions that address the intersection of wildlife, land and people. That means implementing at interventions that address livelihood or educational needs, for these have attendant benefits on conservation. By working in this manner, we’re addressing threats from a multitude of angles and ensuring that conservation is holistic and integrated. It’s a strategy we’ve implemented, to great success, across the continent. Supporting the wildlife authority. 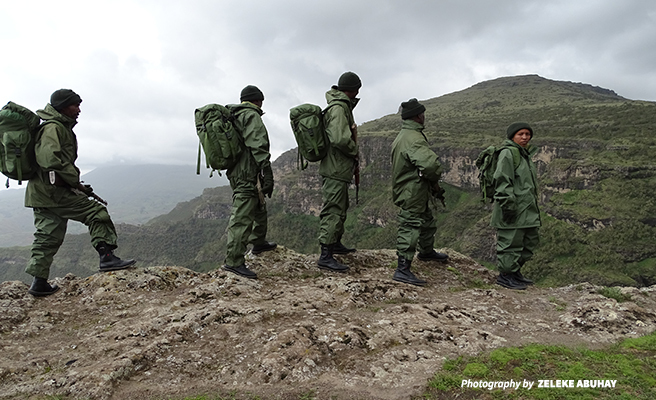 AWF has partnered with the Ethiopian Wildlife Conservation Authority (EWCA) to collaboratively manage the national park. We have also provided gear and equipment to EWCA, from rain parkas and boots to GPS equipment. Engaging with communities. Surveys have found that about 63 percent of the grassland in the park is intensively grazed by livestock. To address this issue, AWF and EWCA have worked with the local community to develop a strategy that lessens some of those grazing pressures within the park. Recently, the community voluntarily agreed to designate 70 percent of the park as a no-grazing zone. Protecting endangered species. Through our Species Protection Grants program, AWF has provided funding support to the Ethiopian Wolf Conservation Programme. 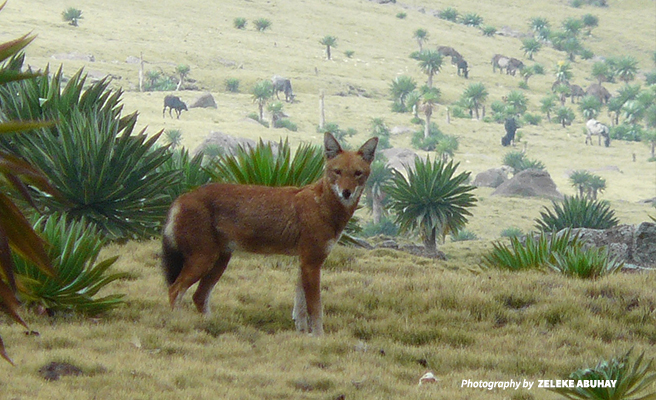 The funding allows this local NGO partner of AWF to educate community members about the Ethiopian wolf and recruit people to become wolf ambassadors that help monitor wolf activity. The program also provides rabies vaccinations for domesticated dogs to prevent disease outbreaks from spreading to the wolves. Investing in tourism. Through our impact-investing subsidiary, African Wildlife Capital, AWF has provided financing to two tourism-oriented enterprises in the area. 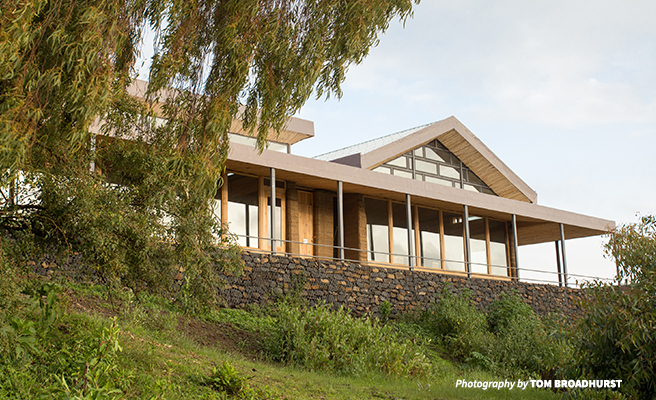 African Wildlife Capital invested in Village Ways lodges, a social enterprise company that is working with communities outside Simien Mountains National Park to build small traditional guesthouses that allows tourists to experience a uniquely Ethiopian experience. African Wildlife Capital also provided investment to Limalimo Lodge, a higher-end lodge that offers guests stunning views and a comfortable experience within the park. Through these lodges, which are employing local staff, we are helping to enhance economic development in the area. What’s more, AWF has developed a tourism plan for the park for EWCA and provided training for the trekking guides that work in the park. The trainings allow the guides to improve their skills and learn how best to accommodate the needs of the Western tourists that visit the park. Educating the younger generation. Africa’s rural communities, such as those living on the outskirts of Simien Mountains National Park, often get left behind in terms of education, with the greatest resources typically devoted to urban areas. Through our Classroom Africa program, AWF has rebuilt Adisge Primary School just outside the park and will bring in teacher training opportunities to improve upon the quality of instruction in this remote school. The Classroom Africa program will also encourage the development of wildlife clubs and other ways to emphasize the importance of conservation. Combined, these interventions multiply our conservation effort and impact. The result is an improved landscape where both people and wildlife are faring better. This article is the first in a series that dives deeper into AWF’s efforts in Ethiopia. Follow along this month and next to see how we’re addressing conservation from all sides in one of our priority landscapes.